The 2015 Passat turbo engine is fun to drive with exceptional responsiveness. Only 170 horsepower give this best selling mid seized sedan more than plenty 'o power, and still provides ample acceleration. 1.8 liter turbocharged four producing 170 horsepower and a six speed automatic transmission. It is no racecar, but it does move pretty briskly. Handling is phenomenal and it corners flatly at all times. The Passat, a very comfortable and dependable car, has one of the most generous and spacious interiors of its class. There is no problem having the tallest of the family be the back seat passengers. The trunk is also very cavernous. It's a great pick for the family, for packing up the kids in toe - with gear! And, all is easy to get to with the 60/40 split folding rear seat. There are so many standard features in the 2015 Volkswagen Jetta (see below). Excellent seating adjustments for complete customization and plush for comfort. We love that there are no blind spots unlike so many others car choices; we had no issues with visibility and give this car an A+ in this category. Dashboard and instruments are well-laid out and quite utilitarian. However, we felt the materials used for the knobs + levers were not synonymous with that of a thirty-six thousand vehicle. Proudly made in America, at their Chattanooga, TN facility. Women-Drivers acknowledges Volkswagen Group of America to being recently awarded a "Top 25 Noteworthy Company for Diversity." Over 1,000 companies competed for the award. Passat is a rather stately looking family car, with a strong sporting street, though you would not know that to look at it. It is a pleasant looking three box design that is inoffensive enough, but is no attention getter, and that is a huge issue in a segment of the market that has become style conscious. I cannot imagine anyone paying much attention to it, because it looks dated. That is unfortunate because this is really a good performing car. It badly needs a redo. On the other hand, it is one of the roomiest cars on the market, and has a huge trunk as well. It is a perfect cross- country travel car and its strong handling and acceleration prevents boredom on the road. 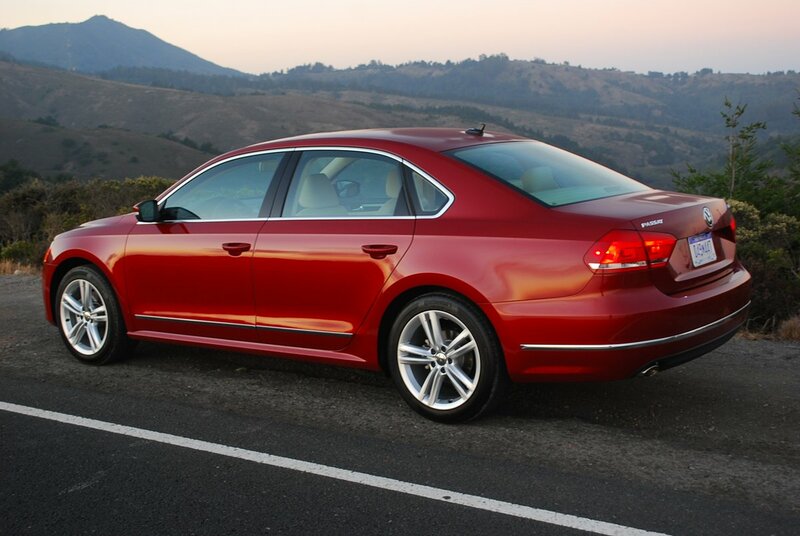 NHTSA gave the Passat a 5 star overall rating. Further, this car is loaded with superior safety features. Quite well equipped. All with all requisite bells and whistles present. Passat received a good rating for. Offset frontal, side with all side airbags and rear crashes by IIHS. Also has Intelligent Crash Response system. The year's model is packed with tons of the latest technology that is standard. The Passat lives in one of the most esteemed and competitive a highly classes, so having to pay $37K an have some amenities missing, IS a miss for this top contender. Standard equipment includes all power-assisted accessories. Premium touchscreen radio and. CD changer with MP3 playback and eight speakers, Bluetooth, rear view camera system, heated front seats, air conditioning with rear vents, leatherette seats, cruise control, and plenty of other perks. Volkswagen must take action to create a more design-centric look. Value and vanilla work only so far in one of the most competitive classes. While the brand itself has about 4% of the US market-share, according to GCBC.com, the Passat is ranked #20 best-seller, however, is double digits off of last years sales. Consumers are clearly asking for something new. I've talked about the exterior. Now let's talk about the interior. One word: Fabulous! VW is at the top of its game in this area, and the expensive looking fittings, flawless fit and finish and two-toned color themes make for a very expensive looking interior. Lots of stretch out room everywhere. 3 years/36,000 miles basic warranty, 5 years/50,000 miles powertrain limited warranty. 3 years, 36,000 miles basic warranty, five year, 50,000 mile powertrain limited warranty.